France, 2008, 116 minutes, Colour. Agnes Varda, her family and friends. 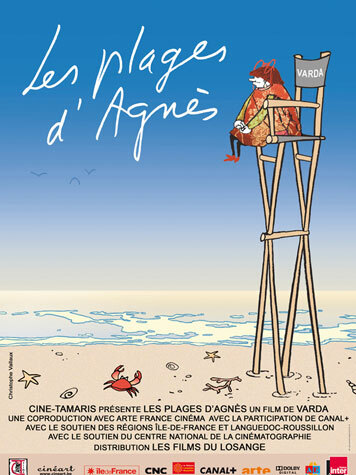 Agnes and Her Beaches was completed when director and photographer Agnes Varda turned eighty. This is her autobiographical memoir. The film has the vitality of the director herself. It takes us back to beaches that were important parts of her life, the opening credits with putting mirrors on beaches. She grew up in Brussels, remembers her family, visits the family home. During World War Two, the family migrated to the south of France and lived on a boat. However, leading a sheltered life, she wanted to break out and went to Paris before she was twenty and became a celebrated photographer, photographing directors, theatre actors and film stars of the period. She recreates this period with many photos, as well as visits to the south of France. With the coming of the New Wave, and her meeting Jacques Demy, she began a film directing career with Cleo from 5 to 7 which won many awards. Demy won many awards at the same time. With some ups and downs, they stayed together for thirty years until his death. During the 60s, they both went to Hollywood, but rather unsuccessfully – although Agnes Varda is very strong on the friends that she made at that period, her appreciation of Los Angeles, her involvement in the protests against the war in Vietnam (which meant that she was away from France during May 1968). As Jacques Demy was dying, she made a biographical film about him, which he watched and helped recreate. In later years she continued with her photography as well as installation pieces. She also embraced feminism and was very strong on pro-choice. One of her failures was a film about the golden hundred years of film-making, with Michel Piccoli and a number of film stars. After the final credits, her family and friends surprise her to celebrate her eightieth birthday. 1.An autobiographical film in images, words? The effect: the story of a life, a person, a personality, a career? 2.The title, Agnes Varda and the opening, the beach, the establishing of the mirrors, the variety of shots? The Belgian beaches? The south of France? Los Angeles and Venice Beach? The theme of beaches? 3.The information about Agnes Varda: her Greek father never mentioning this, her parents, living in Brussels, the war and the south of France, on the boat, running away to Paris, her photography, meeting Jacques Demy, her cinema career, the times in America, back to France, Demy’s death and her film? Her photography and installations in later years? 4.An illustrated narrative, the comments, film clips, photos, Jane Birkin and other actors re-enacting scenes? 5.Agnes as a child, her father, Brussels, the joy of the beach, the large family, her father’s gambling in the casino, dropping dead? Her mother, her care, her mother’s loss of memory and Agnes’s reflection on this? Revisiting the house in Brussels but not feeling attached? The impact of her early years on her? Her not finding that they had such strong force? 6.France, the war, the Vichy government, the patriotic songs for the children in school, living on the boat, her mother’s fears, the fishermen, knowing how to mend nets? Revisiting the town with her brother? The film, the jousts and the street called after her? 7.Running away, her comments on her sheltered life, sexuality (and the French-style indications, visually, of sexuality)? Her work as a photographer, actors and directors, their support, recreating the time? Her visit to China, the photos, the documentary? Her relationships, the birth of Rosalie? 8.Meeting Jacques Demy, with him for thirty years, Mathieu? The ups and downs? 9.The beginning of the New Wave, her giving the background, her admiration for Godard? Her making Cleo, going to Cannes, the tours? Demy and his success, The Umbrellas of Cherbourg, Catherine Deneuve? 10.The invitation to the US, her friends, the producer, Zalman King and Patricia Knott, her making Lion’s Love? Life in America, protests, anti-Vietnam? Her missing the uprising in Paris in 1968? 11.Her career in France, the film for the hundred years of cinema, its failure? 12.The importance of her family, the presence of her children in the film? Her caring for Jacques Demy, the process of making the film, with him present? Recreating his life? 13.Later years, her feminism, her pro-choice stances and campaigns? 14.The theme of walking backwards, memories, the importance of her family, the final film with the family? The post-credits sequence with the eighty brooms and her eightieth birthday?